Fabric Mart Fabricistas: Made by a Fabricista: Plaid Patrones Dress #27 and Striped Bridget Top! Made by a Fabricista: Plaid Patrones Dress #27 and Striped Bridget Top! Hi everybody, it's Virginie from Jazz Couture. Warmer weather has finally arrived here in eastern Canada, and so for my June post I made two summery garments which I'm happy to share with you: a dress from the sewing magazine Patrones, and the Bridget Top from Designer Stitch Patterns! 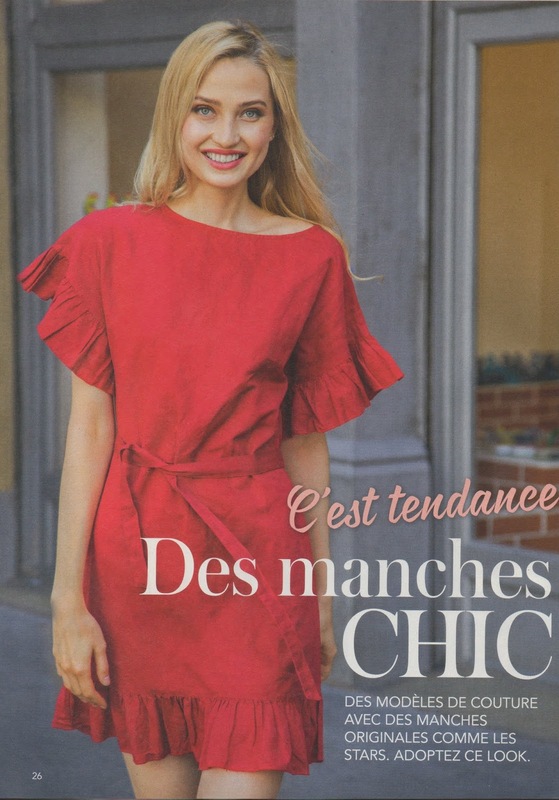 I find myself lucky to get the spanish magazine Patrones translated in french ('Couture Actuelle' in its french version) each month at my bookstore nearby. Dress #27 from Patrones no 382 caught my eye for its simplicity and ease of wear - which sums up my idea of summer dressing! I chose for this dress a wonderful plaid cotton shirting from Ralph Lauren that FM had recently (it sold out quickly!). I just love the colours (aren't they a bit vintage?) and the slightly crinkled texture (that you might see if you enlarge the pictures). It also sewed and pressed like a dream, and even made the plaid matching easy peasy! That fabric is not available anymore, but any 100% cotton shirting would be perfect for a dress like that. I'd recommend this one if you'd like to achieve a similar look, and also this one. Dress #27 is presented in sizes 38-42-46 (spanish sizing), and I made a size 38 which is the closest to my measurements - the dress is not fitted anyway. I has a front and back bodice piece, and a slightly A line skirt piece which is the same for the front and the back. It also has pockets inserted in the side seams but I didn't use them. A quick muslin revealed some differences from the dress picture. First it wasn't mini but more knee length, the front neckline was excessively high, the waist ties were wider, and the sleeve ruffles didn't hang in the same way! Also, the back bodice piece was 1/4'' narrower than the front at the side seams, which is odd... usually it's the front that is smaller than the back. I corrected that to make it the same size as the front. My second make was the Bridget Top from Designer Stitch. I've been wanting to make this top for a while... first I think Designer Stitch has some interesting patterns and solid drafting, and second the Bridget Top is packed with options: round or V neckline, ruffled short sleeve, sleeve with cufflet, gathered cufflet, elbow sleeve with diagonal ruffle... And if you buy the long sleeve version add on, you get more wonderful sleeve options! What's not to love? The fabric selected to make this top is another Ralph Lauren cotton shirting (also sold out quickly!). A blue stripe on a white background screams summer to me, and I wasn't disappointed when I received this fabric, it's a yarn dyed 100% cotton and the quality is just beautiful! As the previous one, it is unfortunately not available anymore, but I'd recommend this fabric if you'd like to make the Bridget Top in striped cotton. This striped silk/cotton is also fantastic - grab it while it's still there! 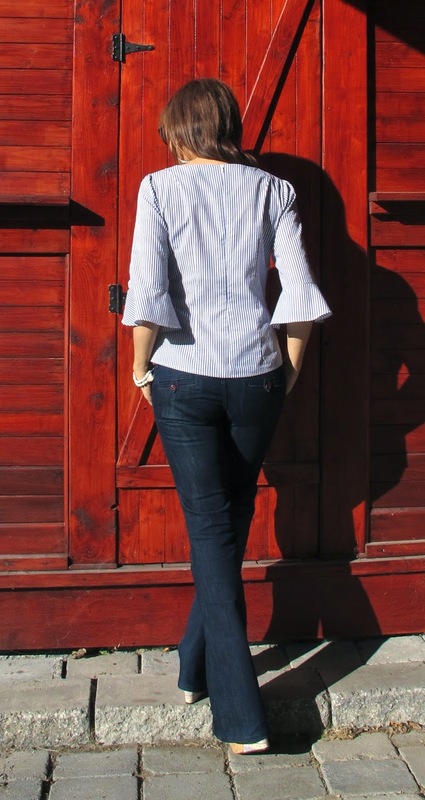 Of course, any fine shirting is a good choice for the Bridget Top. But don't choose anything stiff or heavy for this pattern. First, the Bridget Top is semi-fitted, not fitted as it appears in the technical drawing above. It features 4 front darts and 4 back darts (shoulder, back), round or V neckline finished with a facing, back closing with invisible zipper, 2 hem lengths and a ton of sleeve options. I went for the view on the left, the round neckline and the sleeve with cufflet. The pattern has many bust cup options; I made size 2 / B cup. I'm crossing my arms to show off those cufflets! I cut the sleeve cufflet on the bias to add some visual interest, and finished the hem with a narrow hem and fine cotton thread by Mettler (Mettler silk finish in size 60). 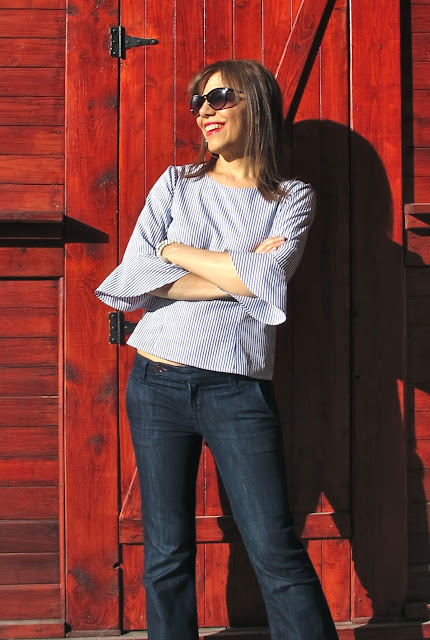 I'm glad I made this top - it goes with pretty much any pair of jeans in my wardrobe! 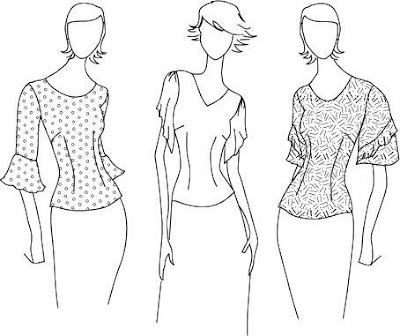 It was my first time working with Designer Stitch, and those patterns are professionally drafted - they have different seam allowances for different seams, everything lines up perfectly, important markings such as bust point and modifications lines are indicated, and you have a ton of options such as cup sizes and design options. Highly recommended! Sewing summer clothes is so much fun - I had a blast sewing those 2 patterns in those gorgeous designer fabrics from FM! I hope you are enjoying summer sewing too, and see you for my next post 2nd Wednesday of July! Both are really adorable, I’m especially drawn to those cute ruffles on the hem of your dress! The plaid dress looks like perfection on you. Adorable! I really love those plaid ruffles! Great makes! The plaid dress is so cute with the ruffle, and these colors are fantastic on you! The Bridget is such a cool look for summer too! Thanks Elizabeth! I plan to make the Bridget again, and I've already made the dress again in black linen this time - totally different look and I love it too!